On Tuesday, City Council will consider a new “housing reset” plan for the City. The staff report going to council barely mentions homelessness and the focus of the report is market rental programs for middle-income people. 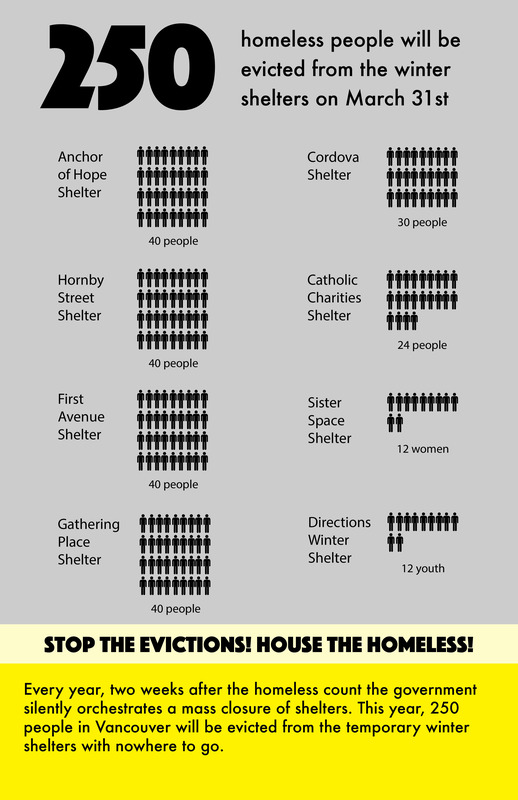 Meanwhile, on Friday, March 31st, two weeks after the annual homelessness count 9 winter shelters will close. This means about 250 people will be booted onto the street, with nowhere to go. Come to a news conference to hear from the people who will be evicted from the shelters, and what they think about Vision Vancouver’s housing reset plan and their promise to end street homelessness.